I have been checking the sightings map,getting all excited. i dont like eatin em either... but they make me some extra easy money. This is the actual link to the site. Last edited by tbn; 03/13/18 05:08 PM. I can eat them every day of the season if i had that many. I did find a motherload one time with my uncle as a kid. It looked like a "gully washer" rain had washed all the spores off a wooded hill into a low spot in the sun. It was hard not to step on them since they were so close together and there were so many of them. It was incredible. Now I just get annoyed when friends want to look while we are turkey hunting. Last edited by btomlin; 03/13/18 05:30 PM. The ones you had must not of been soak in salt water over night. 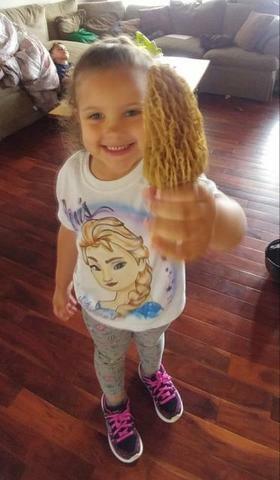 It cleans them right out. 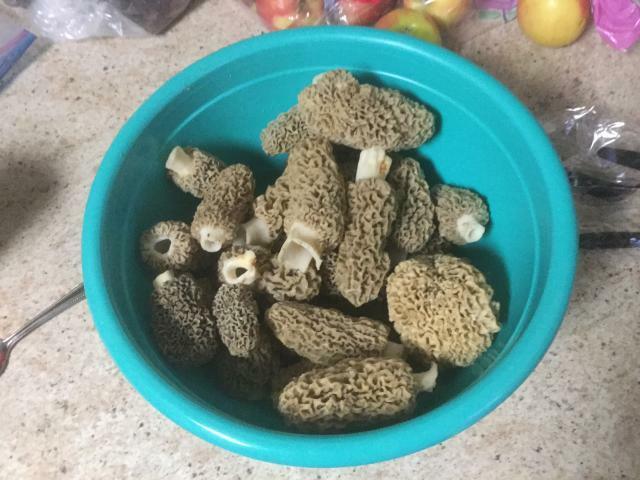 I don't mind looking for them for the fun of the hunt, but gotta find someone else to eat them. Dry here and still too cold. 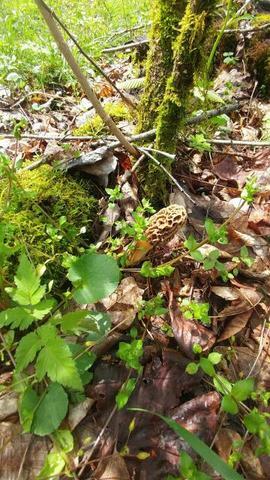 Always seemed to me like the best springs for morel numbers came after a winter with a lot of snow. We had snow but not one of those buried all winter years. 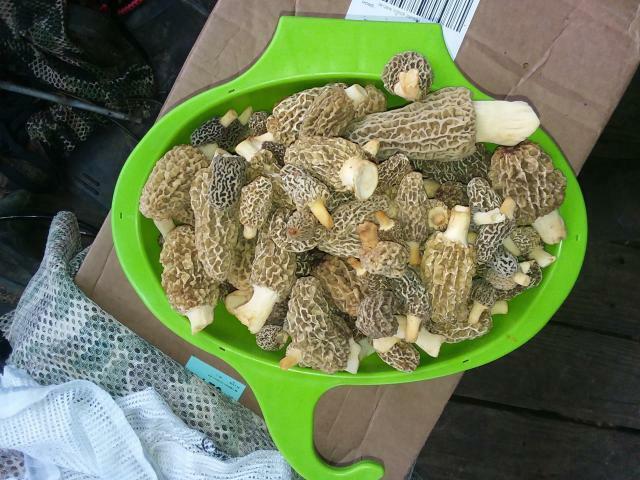 Had enough if we get some rain I'm thinking I may get several meals of spawning crappie and morels. Will be at least a couple more weeks though most likely. Some small one have been found here. 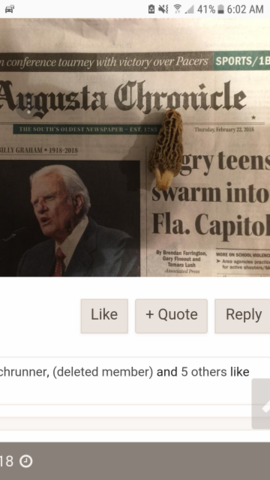 There was some found end of February in Alabama or Georgia. Any one finding any yet? I would have to shovel all the snow first. Still snow in yard and 12 feet of the white stuff at 6000 feet might be awhile before we see any. Kinda looking like an Independence Day mushroom hunt here. May apples are just starting to come up hear in E Kansas so the ground is getting a little warmer. 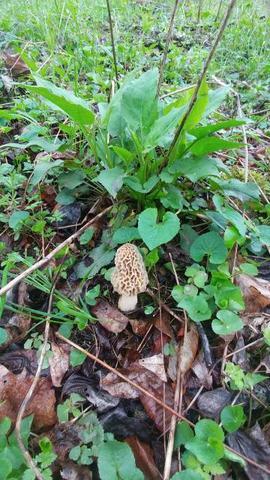 Get a few days of good sunshine the morels will be coming. 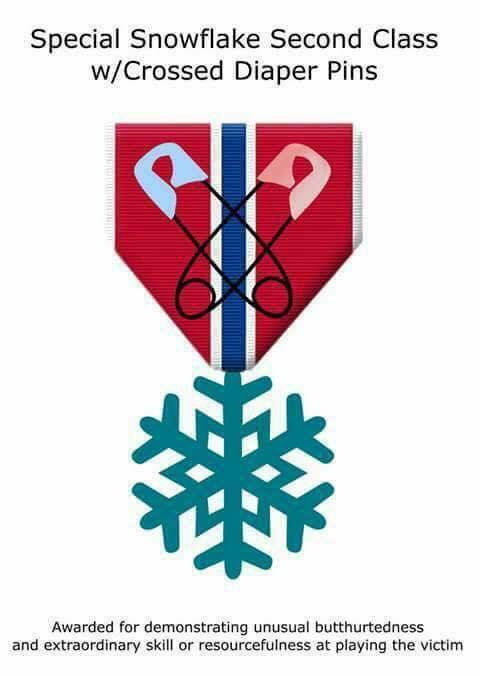 We have a low forecasted tonite for 12 degrees. 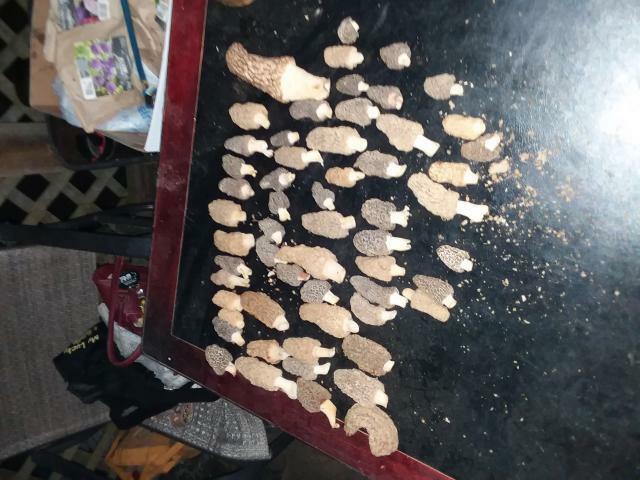 I am gonna wait a couple days to begin hunting them. still to early here our lilacs haven't even got leaves april 9th is the erliest for me as well! I don't eat them either I like them but they kill my stomach im like a goose after eating just one! I can and do eat tame ones without any hitchs! in the early 90s me and a few friends used to go out and pick several pounds a day the best day ever was 96 lbs that's a 55 gallon drum full! I picked a 36 quart cooler full one mourning turkey hunting! that was a fluke year we was picking them around dead walnuts that had died from mark twain lake filling up! I don't expect to ever see any thing like that again! Last edited by ESW; 04/01/18 12:07 AM. I did left over 40, but thanks for the tip. Good! Glade you know they can get bigger. I tell everyone that says they find little ones to let them grow. 99.99% of the time ai get the same answers. 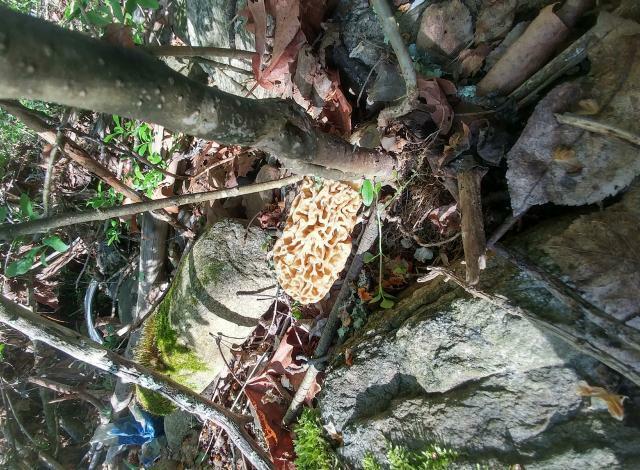 Mushrooms dont grow and if I dnt pick them someone else will. 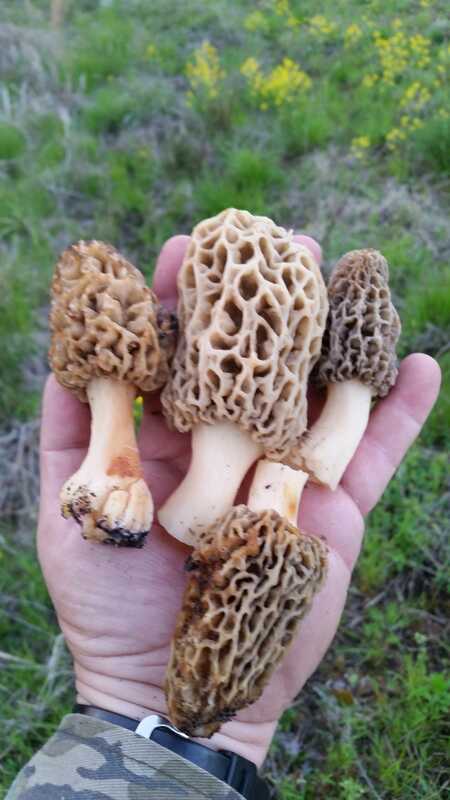 I dont eat them and have not hunted em in a few years but this year i am going to get some. We did pick some smaller one that were at public land by a road, lot of tracks where people had been hunting them since the rains. On all the private land I let them grow. I hope it turns out to be a decent year I am hearing a lot of people are finding 50 to 80 at a time. 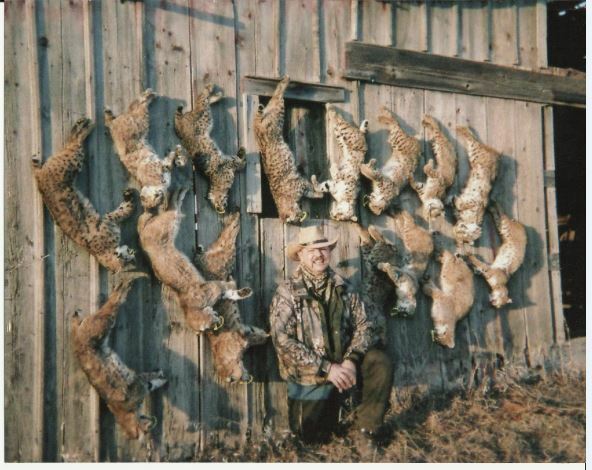 We had to hunt hard and go to 2 diffent county's to get the 148 we got. They just aren't up well at my spots most are too small. I have never seen one grow any bigger than when I first found it.. 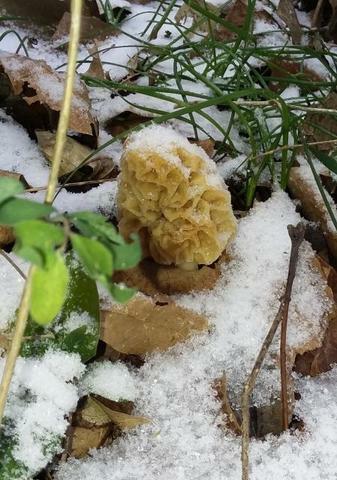 I have them growing in the pine trees right beside my house. I find them in the morning. I have let them go and measured them. I have not touched them for up to five days and they never get any bigger. I have covered them in pine needles to simulate darkness, or not being completely out of the ground. Once again, they never got any bigger. I know people say they will continue to grow but I have never seen one grow any bigger than what it was when I found it, and I have let them go for several days.. I check and monitor them daily and I know when a new one pops up so it is not like it was growing bigger and I didn't see it.Maybe you have different morals than I have, but mine pop up and they are done growing. They definitely grow. Some times takes a couple of weeks but the little grays are immature yellows. Just came in from walking around the garden. The asparagus broke through today, still to early for it too. It will most likely freeze off this week. My little grays have remained little grays. They have never become yellows. 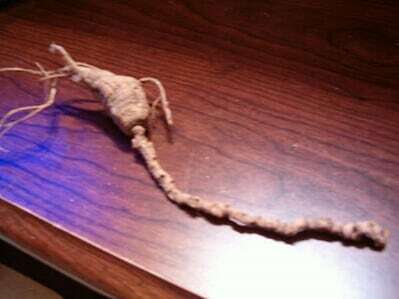 I have let them go so long that they have dried up and withered, and they never grew. 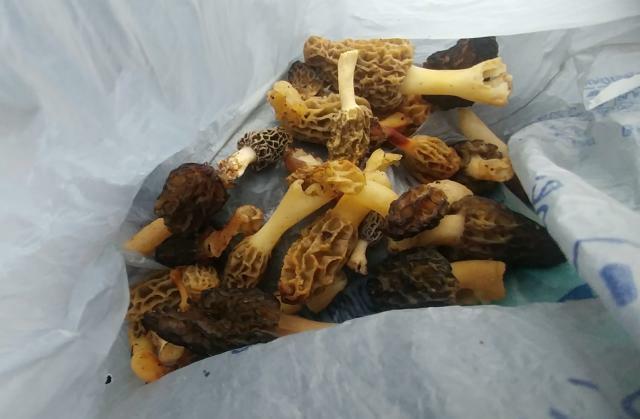 They have found them within 20 miles of my place. 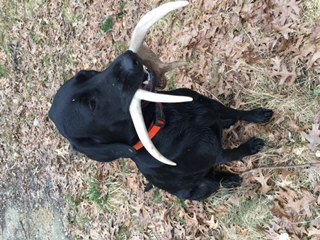 Time to start lookin for them, good time to take the dog for a work out. 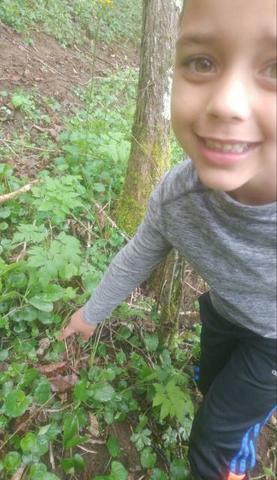 Nice finds Matt28 and meamc2! Still little early for me, mid 20's at night the next two nights not going to help. Since those two or three years of severe drought several years ago, only one of my places where I used to find them produces, and the last two years it hasn't either. Boy Matt you're killing me lol. Those are awesome! In my neck of the woods it's pretty much the same as 45/70 was saying. None of my old spots have produced since the drought. 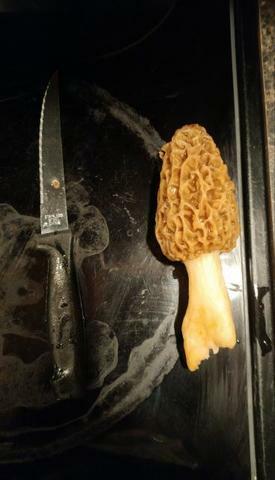 I went mushroom hunting at least 10 times last spring and ended up finding 1. And I really wore out some boot leather in places that have been steady producers my entire life and on some new places as well. Thanks I had to do some walking to find them. But I kept getting phone calls and text messages and every one was finding them so i had to try to make a showing lol hope next weekend is better. I am just wondering what these cold nights will do to them? for the most part, greys do not become yellows? I’ll even make it so you don’t have to look it up yourself. I've even fed them water hoping they would grow. They will fill out a little if they were drying up, but that's it. Will my toes ever warm up? I'm Gonna die with my boots on. 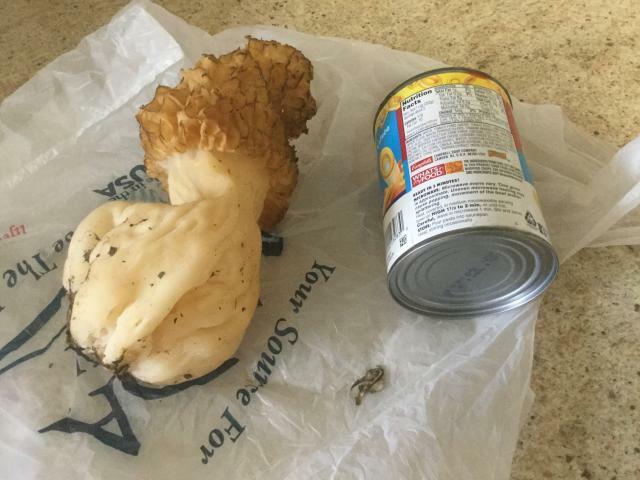 What kind of Mushroom is this ??? The kind that will leave you talking to yourself, lol. 29 this evening. Made for a good dinner, I left some small one to see what will happen if it freezes. Nope they are all the same. If left alone and they have moisture and do not burn up they will go through their normal life span. 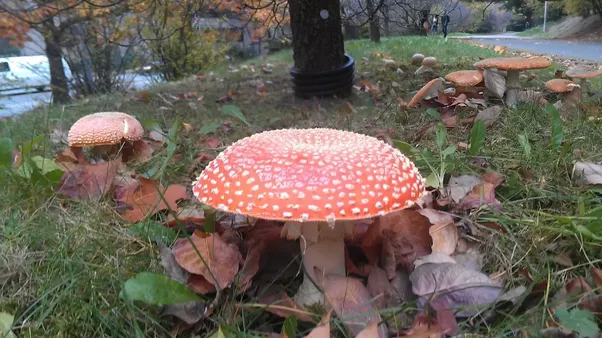 Mushrooms do not just pop up. They grow. I have hunted them over 20 years too and I know for a fact that they grow and do not just pop up. They have a life cycle. I have watched them go from 1/4" to 5-6". Watched some in the 4/5" range grow to 7-8". I stand corrected. I kinda meant once they pop and grow to size they do not continue growing until they die or are picked. 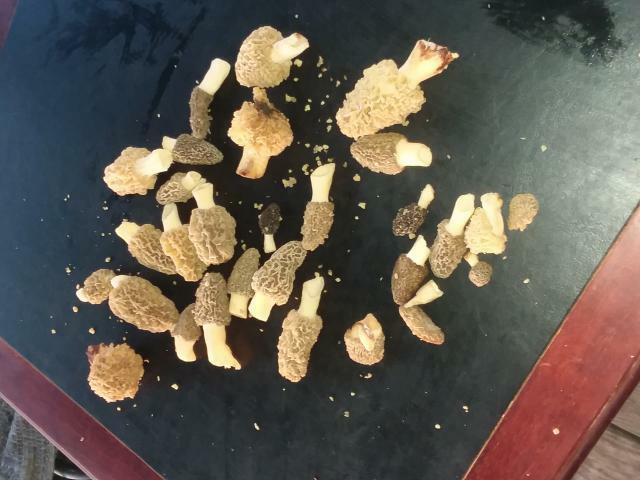 I have put items beside morels and a week later they were the exact same size. Meaning after popping and growing to size they did not continue one bit more? Dependant on the situation. 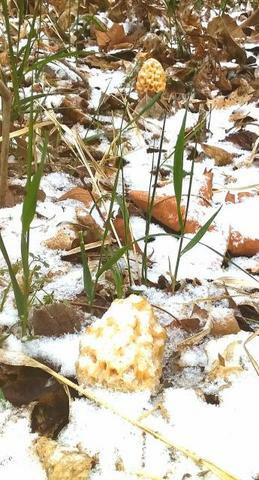 Weather and fungus condition. 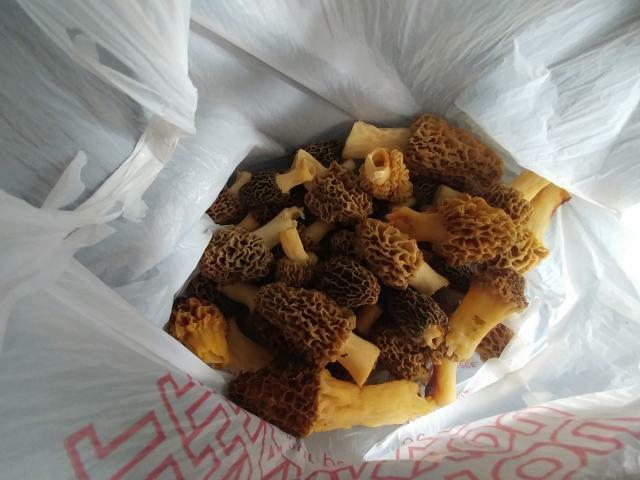 I have found that roughly 50% would grow after I found them if they were 3" or bigger but 100% would grow if they were less than 3" when I found them. I will say it is mich easier for me to not pick them than most people. I do not eat them so when I pick them I am interested in weight and if leaving some means I may make more then I dont have a problem doing it. yes greys and whites are just immature yellows. they grow in spurts. some may go through several stages/spurts and some right next to the others may mature in one evening. 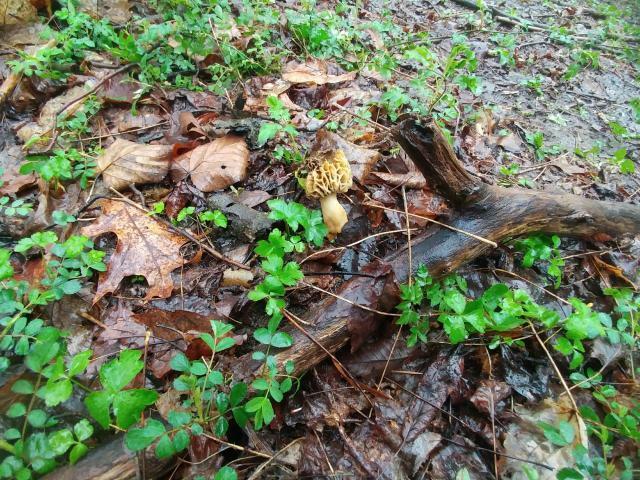 once the shroom turns yellow it is mature and done growing. the key to them continuing to grow is dependent on time and moisture. if they dry out it all over. wind and sun are the 2 big factors. if your not a believer the next time you find a patch of those little 1/2" tall "greys" pick them but save a couple and bury them with a foot of leaves. 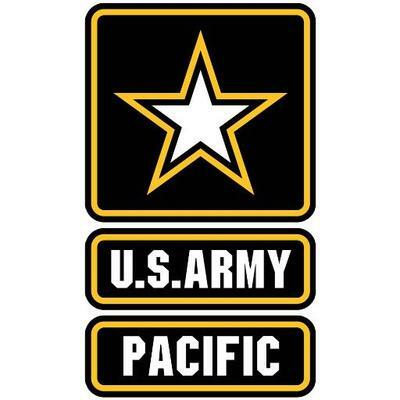 check on them every few days and report back to us. for those that still are not sure, most of you have found a mess of "greys" around a dead elm and a week or 2 later returned to the same spot and now the Yellows have appeared. 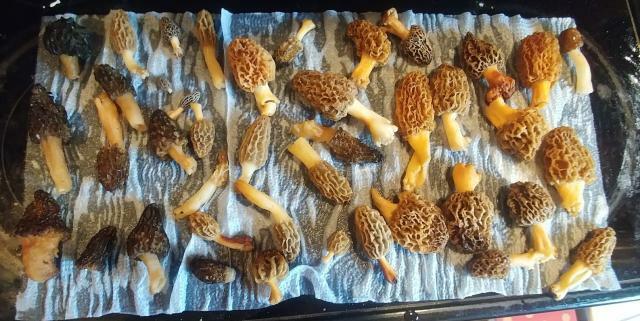 most likely the yellows were either to small to find when ya picked the first flush or they had not started yet. i have had some in my yard i photographed several stages over a 3 week period growing from a 1/2 tall to nearly 8 inches. the ironic part is the last spurt they went through there were several new ones that grew the same height overnight less then a couple feet away. 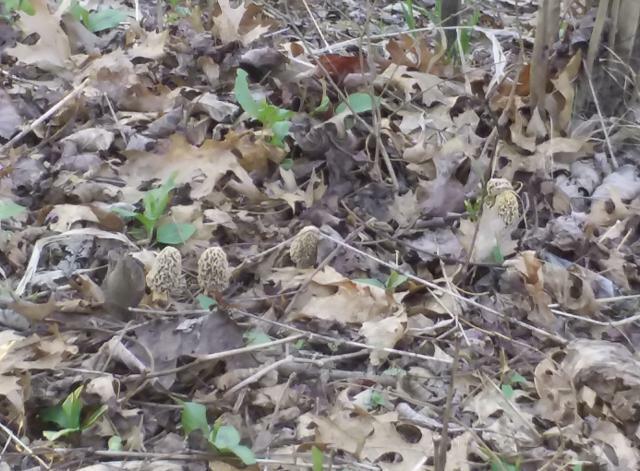 blacks start popping week or so from monday the way weather looks finish bathroom thursday be ready for vacation time 4weeks or so start mushrooming foodplots and chasing turkeys and seeing the picture GOD paints me every morning truly the land of the free! It was a slow start for me, but there starting to grow better now since the warm up. Got 432 for the season so far, would like to break 500. There are some people that have found over 1000 thus year so far. Don't do anything you don't want to explain to the paramedics. I do appreciate a good story tho. 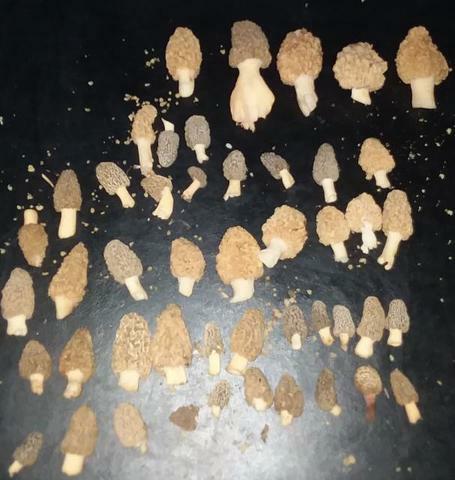 Saw a picture on Facebook, young kid near Frankfort Kansas found a bunch last week. pay attention to your lilacs. when the blooms start to crack open and you can see the hint of blue the blacks should be up. once the blooms are done the season is over. i have yet to find a plant that better "brackets" the mushroom season. Good advice.....a jingle that is kinda a joke but usually true is "When the lilacs are bloomin it's time to go shroomin"!!! Usually the nice tans are poppin around here big time. The little ones (really little sometimes) are usually before the lilacs bloom and then there are the Giants. Usually at the end of season for sure!! never heard the lilac thing before. I'll start watching mine and see how ti goes. when the mayapple show up (this past friday) i start to get the urge, and it seems the poplar leaves are about the size of a golf ball to palm sized when the season is really getting started. 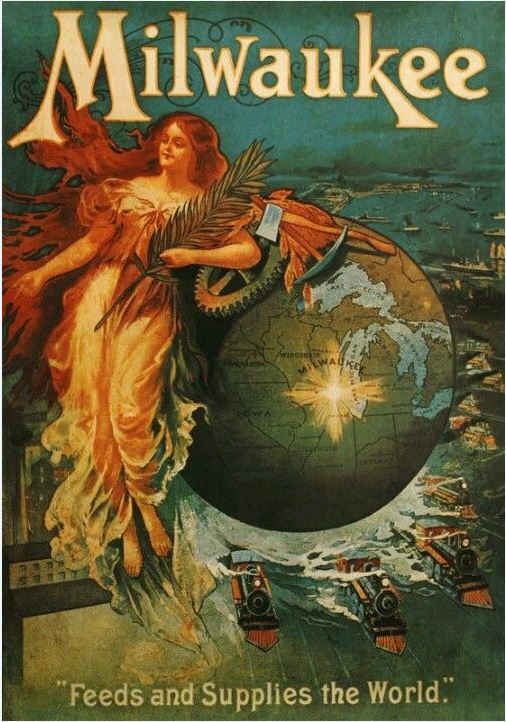 they aren't their yet. we had good weather saturday, but it turned colder sunday, colder still today....and again tomorrow. then some warmer temps. They would be buried under a foot of snow around here. That has been my results too.45 years of chasing schrooms and a gray is a gray. A gray is an immature yellow. Cover it and give it time to mature (yellow in color). Yup. 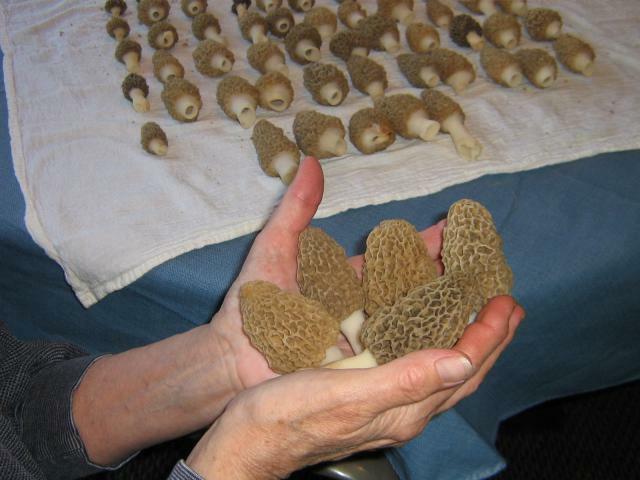 I've got a few spots where I practice quality mushroom management on. Grays are just immature mushrooms and will grow into yellows given the right moisture. Blacks are a different species. The way this year is going it might be 2019 before I find one. 3 to6 more inches of snow forecasted for tomorrow,with 6 on the ground now. Nice! They will be delicious. 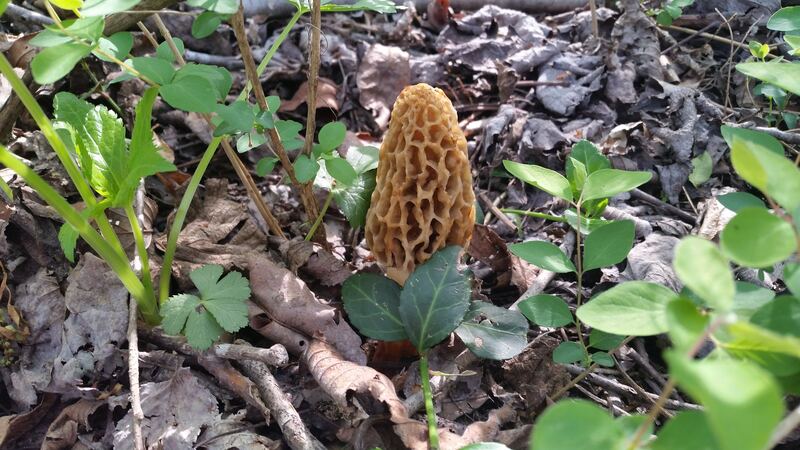 a few scattered reports here in VA.
I’ve found a few greys and half free morels around here. Really nice blacks! 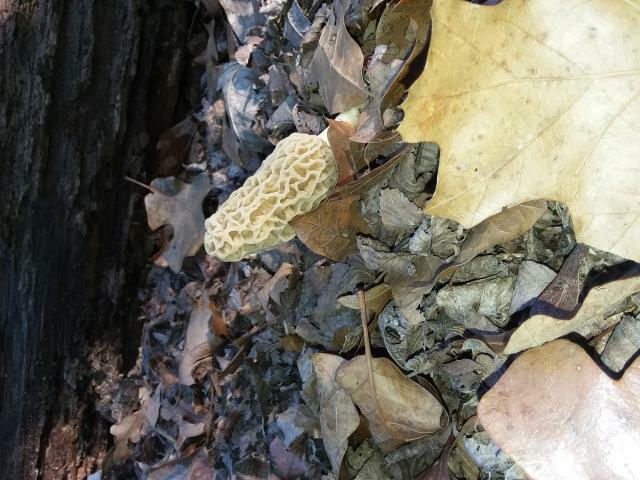 I have only found 3 here in my hunting spots. Guess they don't grow much here. Most all look fresh that's a good sign. 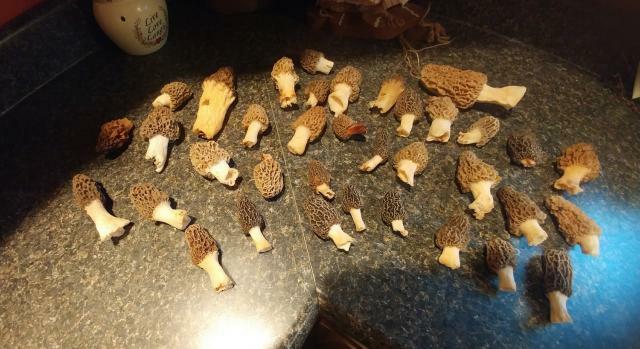 I all ways think about the 1000's of morels thats out there, all I got to do is find them. I actually started looking around sycamore trees close to the river and found some, that's something I'd never done before. Found the black ones on a old logging road back on the mountain. Seems like they are behind this year due to the cold spring. What's the latest you find them Matt? Mid may is the latest for me but this year has been the lonest good season going on 4 weeks of good picking. I have the best luck around elm and ash here with some cotton wood and sycamore too. Newbie at this, so let me ask. Is there a particular part of the day that is better for finding them? Or are your odds the same? 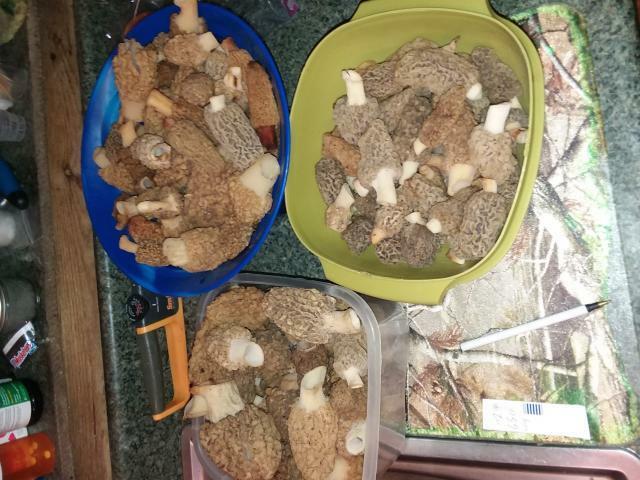 I have only stumbled upon a few while turkey hunting. But where I hunt is mainly oak and hickory creek bottomland that floods regularly. So I just may not be in a good area. Thanks for replying. Been high 40 low 60s during the day here. And we have had enough rain this year to float the titanic. 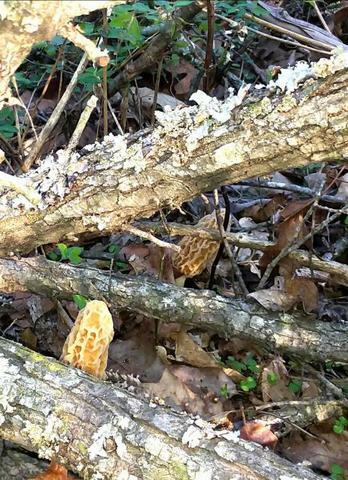 Might be to late in my area but the turkeys aint cooperating this morning so will hunt shrooms on the way out. As I posted before, pay attention to your lilacs. 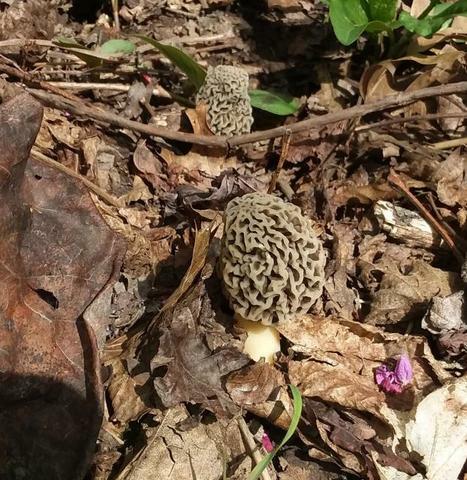 If they are blooming the mushrooms are up. 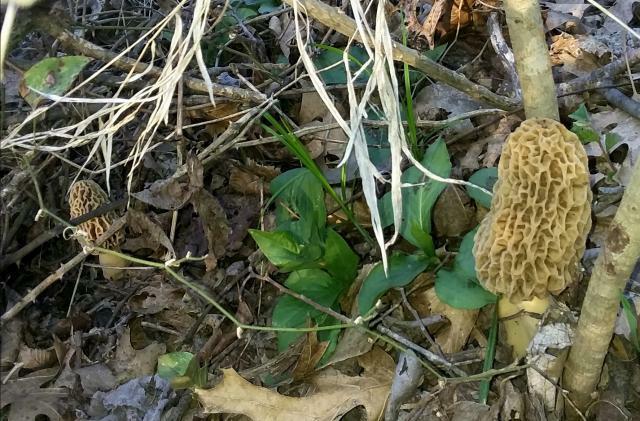 Once the blooms are done so is you morel season. What's your 4in ground temp chuckles84? 56 is a good number for here I think. I don't guess we have lilacs here or I don't know where any are. How do you like to eat them RM? Not sure on the ground temp. I was a fry them type but me and my daughter Will eat all I can cook sauttee in butter and a dap of bacon grease. The secret is to put them in by them self no butter or anything first turn the burner up hot and let all the water come out when the pan has a lot of water in it drain it off and add butter and seasons and cook till they start the pop. found a couple here a couple days ago. Going Friday and expect to find several. It rained an inch here yesterday. Ya let me know how you like them if you don't try stuffing them with sausage and stove top stuffing then roll in flower and fry. Anybody else finding any now? 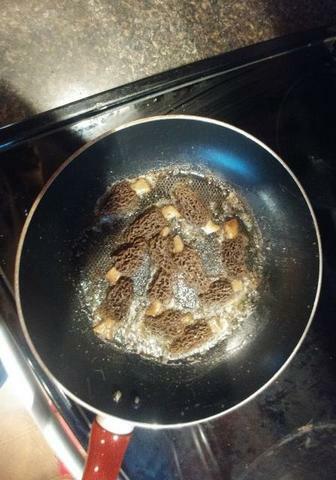 I found 10 this evening and we had a fish fry at my parents house, mom stuffed the mushrooms with jalapeno,cream cheese and crumbled bacon. Then floured and deep fried. They were good. Sauteed are great they are my favorite, but it takes so many to make a good meal when sauteed. 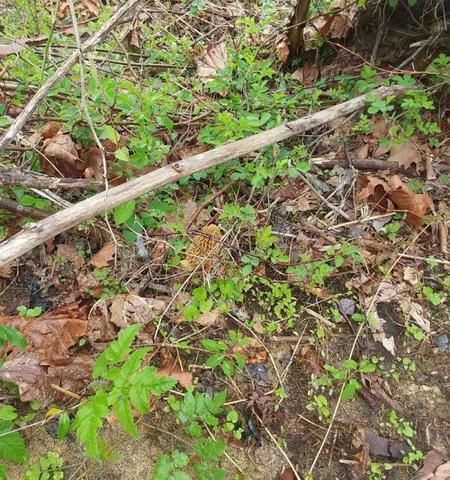 What trees did you find them under? 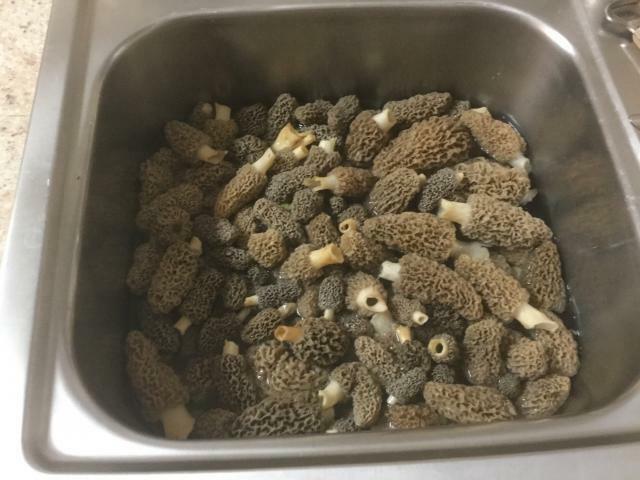 I hear popular are good for the black morels. How old do you figure the Apple trees are? I hear the old one are the ones that really put off the mushrooms. The orchard I look in has been abandoned and overgrown for 50 years, I seem to do better around the old dead ones than the live ones. I find a lot of black ones in old gravel roads, seems they are something in the gravel that really makes them grow. Some locals just ride the old gravel back roads and find them on the edge. I enjoy getting out in the woods and hunting them though. I have been doing really good under the sycamore trees on the river banks, and its the first year I've ever looked in places like that. 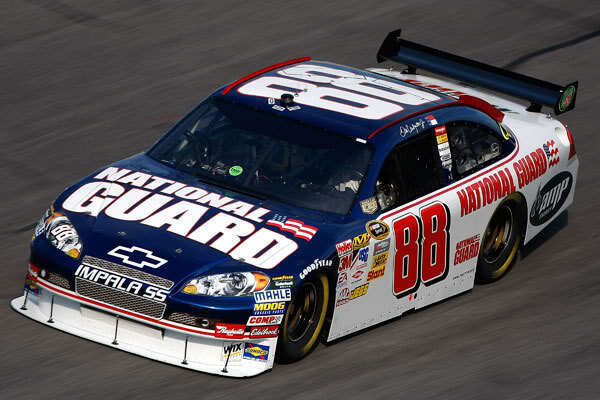 Is your season about over Matt? We have had some warm weather here so it's pretty close to over. 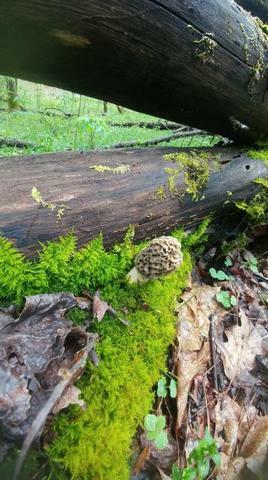 That's a really nice pic of the morel and log and nice finds. 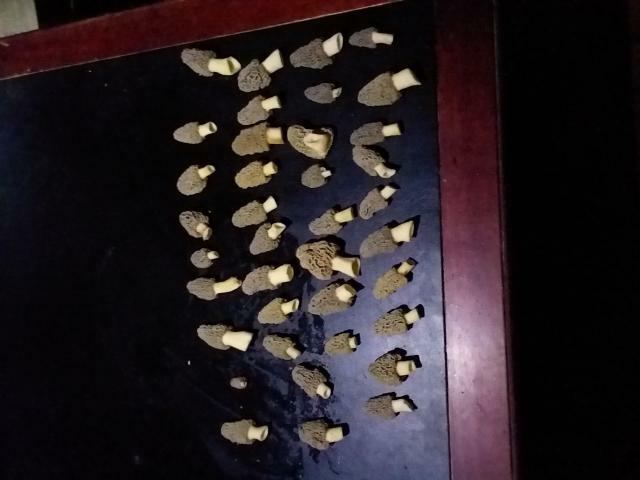 I found about a dozen yesterday. This warmer weather should get em shooting up everywhere. 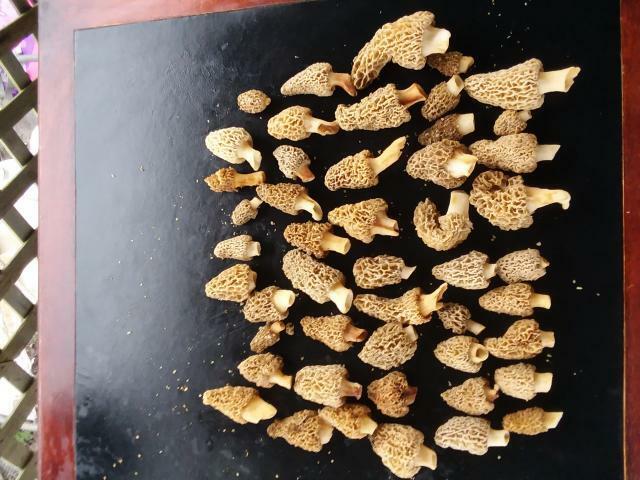 I found about a dozen while turkey hunting in Missouri last week. 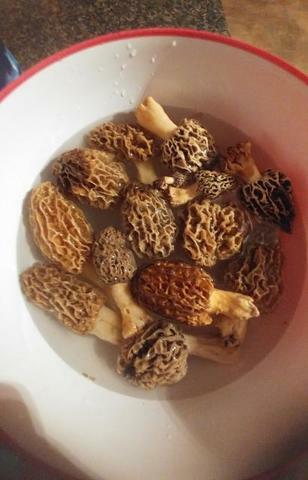 I don't really know what or where to look for them but found these just outside a field under a dead tree. I haven't been in awhile may still be a few fresh ones but I bet there about done. Glad your have a good year RM. my lilacs just started to show color. maybe sunday there will be some immature yellows popped up.